With the Women’s World Cup playing regularly in the background of our house lately, I got thinking about how being a good parent is a LOT like being a great coach. After all, a coach has to use many of the same qualities that a great parent has to use to get their players to support each other, to cooperate, and to be happy and successful. Today I’m sharing 16 lessons that we can learn from great coaches to create our own “All-Star” families! Amazon Affiliate links are included on this page. See Disclosure for more details. 1. Great coaches get the players to work together as a TEAM. They know that everyone needs to contribute to make a team function smoothly. They know that one “star-player” cannot win the game for everyone, and they understand that players will get burned out and resentful if they are working hard while others are not. 2. Great coaches recognize and ENCOURAGE their players’ individual strengths, and don’t play favourites. They set each player up for success by helping them find the position most suited to them. They avoid comparisons between players because they know that even though strikers are the ones that usually score the goals, the team can’t function without also having defensemen and a goalie! Parent Lesson: Provide opportunities for kids to try many different activities and to pursue their special interests. Support their choices. Avoid comparisons between siblings as this can increase competition and resentment between them (Faber & Mazlish, Siblings Without Rivalry: How to Help Your Children Live Together So You Can Live Too). 3. Great coaches make time for both whole group activities and INDIVIDUAL coaching. They know that whole team activities boost morale and help teammates learn to work together well. They also know that players benefit from one-on-one coaching because they can get personalized feedback. Parent Lesson: Kids love when parents make an effort to spend quality family time together – think games night, family camping, group picnics, etc. They especially flourish when each child gets some one-one-one daily connect time with their parents (Lawrence J. Cohen, Playful Parenting ). 4. Great coaches don’t play FOR their players, they TEACH them how to play themselves. When it’s game-time, many great soccer coaches can be seen sitting on the bench relaxing because they know that their job is done and the team’s success is now up to THEM. Parent Lesson: Teach kids to be as independent as possible. Prepare them for the “real world” by honouring their struggle, empathizing with their frustrations, and encouraging them to keep trying. Read more ideas here on encouraging independence in toddlers/preschoolers. 5. Great coaches know how to create a team identity so that everyone feels like they BELONG. They know that each and every player must feel like they are a part of something bigger than themselves. They also know that a successful team plays hard, not just to win, but for each other – so they don’t let each other down. Parent Lesson: Research your family’s last name, create fun and special family routines and traditions at holidays or on weekends, look at family photos often, create fun family t-shirts, refer to your family as a “team,” etc. 6. Great coaches give their players positive ENCOURAGEMENT and descriptive feedback to improve. They avoid criticizing players’ mistakes and instead focus on communicating to the player what they are doing well, and what steps they can take to improve. 7. Great coaches keep their COOL when players make mistakes. They accept that mistakes are inevitable and they keep their composure when their team is not performing well because they realize that team morale is one of the most important factors in their eventual success. Parent Lesson: Punishments can be detrimental to kids’ self-esteem and can disrupt the parent-child connection. Become familiar with positive parenting discipline strategies. 8. Great coaches make sure their players understand the RULES of the game. They ensure all players know the rules before the game starts and they strive to keep the rules consistent so players know how to play. When rules change, they explain what has changed and how the player needs to adapt. Parent Lesson: Make sure your expectations for your kids are clear to them. Have kids repeat back rules/expectations to you to check for understanding. Review rules ahead of time for new situations. 9. Great coaches give players PEP TALKS before the big game. They don’t sent players out onto the field without first reviewing expectations for performance and sharing a plan of attack. They help their players visualize their success. Parent Lesson: Talk with your kids about your expectations for behaviour before situations that you know will be difficult for them. Brainstorm appropriate ways to behave and send a clear message that you know they can make good choices in the situation. 10. Great coaches MODEL good sportsmanship and EXPECT it from their players too. They know that how THEY behave will set the tone for the entire team. They take a leadership role in demonstrating honesty, and fair play, as well as gracious winning and losing. Parent Lesson: Kids come to behave as they see US behave. Our actions speak much louder than our words when it comes to things like: being honest, following rules, using social graces, avoiding gossip, and being grateful and respectful. 11. Great coaches use Time-Outs to regroup, PROBLEM SOLVE and re-strategize. They know that focusing on how to improve, instead of what has gone wrong, will boost team morale and is the quickest way to see improvement. Parent Lesson: Instead of Timing-Out kids for poor behaviour choices, try using a Time-In and focus on re-connecting, understanding the child’s unmet needs, and finding alternative healthy and positive ways to meet those needs. 12. Great coaches LISTEN to their players and welcome suggestions and feedback. They know that players need to feel heard – especially when they are the ones that are out there on the field and may have a different view of the game. They listen respectfully and humbly, and consider players’ differing viewpoints. Parent Lesson: Learn about the different ways to show your kids you are listening so they feel truly heard. Consider holding family meetings where everyone can contribute their ideas. Strive to create a family atmosphere where all members feel respected. 13. Great coaches accept when their strategy isn’t working – and they CHANGE it. They reflect on their game plans and honestly evaluate whether their strategies are meeting with success. If things are not working, they talk with other coaches and experts to get more ideas, and try new approaches to help their team be successful. Parent Lesson: Realize that parenting is an ongoing journey and that no one is perfect. Ask for help if things are getting challenging. Work on being a more flexible parent. Be open to learning new strategies. 14. Great coaches focus more on EFFORT and IMPROVEMENT than on success. They know that players cannot control whether they win or lose, but they have 100% control over the amount of effort they put in. 15. Great coaches CELEBRATE successes with their team. 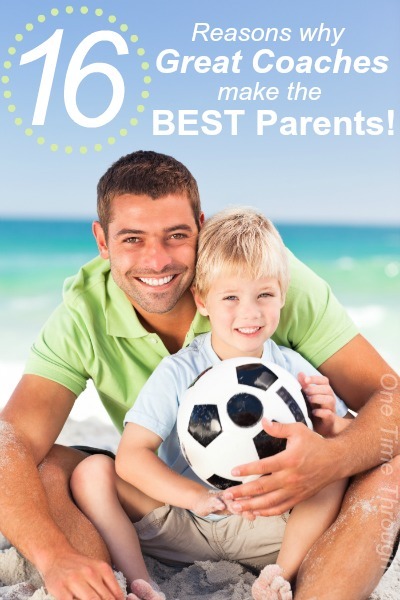 Parent Lesson: Find fun ways to celebrate your child’s small successes, milestones, achievements, and birthdays. Remind your child of past successes when they are struggling with new tasks. 16. 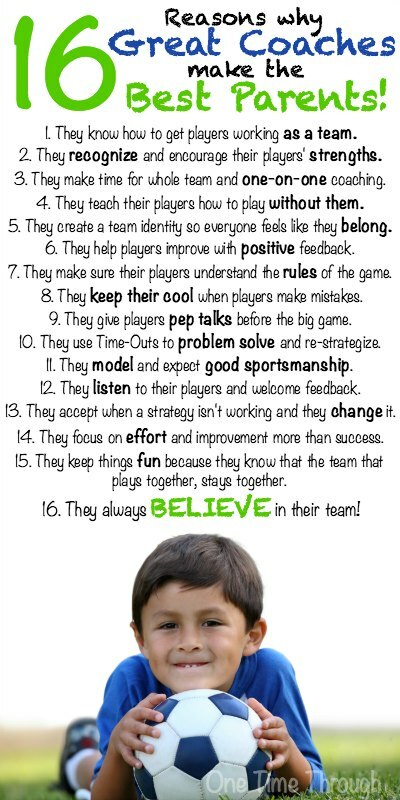 Great coaches BELIEVE in their teams! They convey the belief that their team will succeed with such unwavering certainty that players cannot deny it. Parent Lesson: Be your child’s biggest supporter, best advocate, and number one fan. They will carry your belief in them inside them like a flame forever as a testament to how much they are loved. Coaching, like parenting, is incredibly hard work and takes much dedication and many hours. But great coaches (and parents) know that their investment is worth it when they see their players improving, growing and being successful out on the field of life! 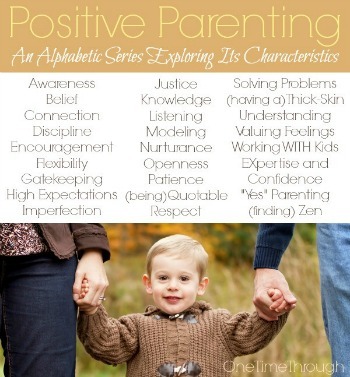 Today’s post is part of our Positive Parenting: An Alphabetic Series. This week’s topic was R is for Respect. I couldn’t think of a better analogy for being a respectful parent, than thinking of ourselves as our children’s coaches. When we choose to positively parent our kids, we are choosing to lead them and teach them – like coaches, not like bosses. I hope you enjoyed my analogy – and maybe I’ve even inspired you to watch a little of the world cup! If you’d like to have a FREE PRINTABLE COPY of this list – you can download it from our Free Printables page or click on the image below. Would you like to keep following our positive parenting journey? Just add your e-mail to the box below! I’d love to hear your thoughts and ideas! Leave a comment below.